When we look at the ancient poles that were once located on Greenland, it should be clear to anyone that such massive catastrophic events do not go unnoticed. Nor do they take place over the course of a few years, because the earth’s crust is too massive to change overnight. The ancient locations of the geographic poles are mathematically proven by us – 100%. It is also an established fact that the crust deformed on a massive scale and the geographic North pole migrated in several steps to where it is today. Our next task here is to attach a timeframe to our discovery. That is not as easy as it seems, because that demands a thorough scientific study. Massive cataclysms invariably leave huge traces in geological records. When did that happen? How old are these poles? How long did it take for the poles to migrate to another location? If the ancient monuments were oriented to these different poles in vast numbers, and if they are proven to belong to the era of these poles, are they then as old as these poles? The research that we have done to prove the age of the former poles is profound and rather complicated. In this part of our website, we progressively take you through this process and explain to you in detail why and how we know 99.999% for sure how old the poles are, and thus we can confirm that the ancient structures belong to these specific poles. Fig. 1: This graphical representation of an underlying mathematical reality shows how most of the ancient monuments cluster as nodes around Greenland in a latitudinal direction, hence causing radical climatic changes. The probability for this clustering to form coincidentally is 0%. That means we have 100% confirmation that this clustering is evidence that the ancient builders oriented their buildings to former geographical poles. | © Mario Buildreps 2015-2018. Crustal deformations of this magnitude do not go unnoticed. Nor did they take place overnight and they did not occur only a few thousand years ago. The youngest former pole (Pole II) was located on Greenland at a latitude of 76.1°. This pole has been mathematically proven by us with an uncertainty of only 5.59×10-19. In scientific terms: it is a 100% certainty that its location is factual and true. It is an understatement to say that these crustal deformation processes were very destructive for most life on Earth. When the crust deforms on this scale it causes prolonged megaquakes, tsunamis of gigantic size, and massive volcanic eruptions. While the crustal deformations take place, these catastrophes continue for many millennia. In their sagas, the ancient Greeks do not mention anything regarding a global cataclysm that might have happened during that time. We take this to indicate that these huge cataclysms occurred before their time, more than 3,500 years ago. Plato muses about the city of Atlantis that was reputedly swallowed by a raging flood. The Bible speaks in Genesis of a deluge that swept over most of the face of the Earth. Could this pervasive flood narrative be anchored in truth but was almost lost in the mist of time? In fact, all cultures from Africa to America, from Asia to Europe, and from Finland to Polynesia have their own myths about floods and cataclysms. For instance, the legends of the Hopi Indians speak of multiple worlds before ours – a view that we agree with. Because these sources are separated from each other by vast oceans, talking about the same topic, this should be taken very seriously, and should not be treated by academia as fairy tales only because it does not fit their distorted belief system. That is unfortunately all too often their unscientific approach to this very intriguing topic. We are speaking of at least four consecutive deformation cycles that moved the geographic North pole from the South of Greenland all the way over the entire area of Greenland to where it is now. We have found that the pole moved over a distance of more than 4,200 km (~2,600 miles), in four distinct steps, which translates into five poles. We have found these five poles in an unambiguous mathematical way, but it has been difficult to find more ancient poles with equal precision. Therefore, we have focused our research on only five poles and four deformation cycles. These poles are defined by the orientation clusters of ancient structures randomly spread all over the globe, thus suggesting practically worldwide deluges and cataclysms as mentioned in the Bible and by virtually all cultures around the world. Do Deformation Cycles Look Like This? Fig 2: Deformation cycles of this magnitude did not remain unnoticed in ice core samples. We also suspected that such huge crustal deformations required an external “force”. This force could be generated by an eccentric orbit (radical annual gravitational changes) of the Earth around the Sun. We see a one on one match between eccentricity and glaciation cycles. That is a strong indication that eccentricity caused crustal deformations which were then interpreted by Science as “ice ages”. Do you notice the magnitude of the temperature swings A to D? They show up in the same order as the distances between the Poles I to V. E is the yet unproven pole VI. | © Mario Buildreps 2015-2018.
the ice cores extend over a long enough period to determine possible matching patterns. Tree rings, for example, cover too short a period of time to show a record of even one large cataclysm. What we see here is that the sequences of the relative magnitudes are the same, i.e. the relative distances between the poles are in the same order of magnitude as the largest relative temperature jump in the glaciation graph. The probability for this sequence to match coincidentally is 1÷nn = 1÷44 = 1÷256 = 0.00391 or 0.39%. That means that we can be more than 99.6% certain that we are looking at the correct time frames of the deformation cycles. To prove that we are right we have gone even further. 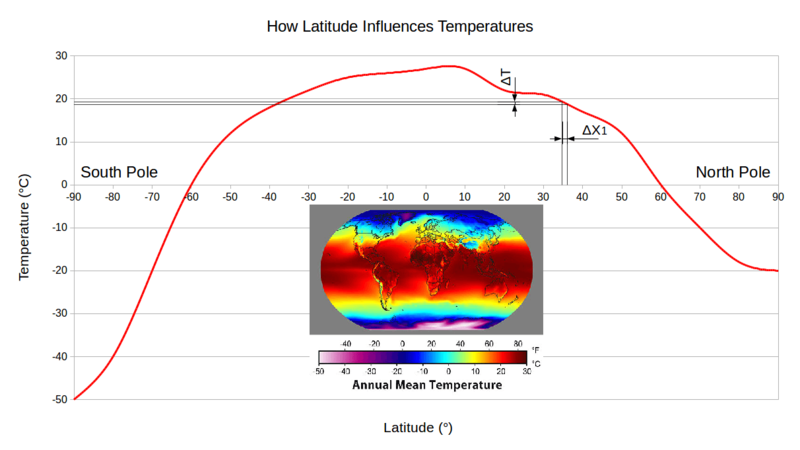 It is crucial to understand that in the graph of Fig 2. there is also a “natural” temperature variation present due to varying Sun activity, slight variations in the Earth’s orbit parameters, changes of ocean currents, and variations in CO2 levels. These natural variations are expected to occur not only when the crust is stable but also when it is unstable, i.e. it is always present – a sort of “background noise”. The Sun’s activity will vary no matter what, the ocean currents will continue to vary no matter what, the orbit parameters will have their own agenda and even the CO2 levels will periodically change. Reliable data over the last two millennia can be found by using tree ring data and ice sheet data from Greenland. Fig. 3: This graph shows the temperature reconstructions of tree ring data. To get a reliable, representative bandwidth we used the σ95 technique which filters out the extremes on the edges. The extreme 5% would pollute the data to a disproportionate degree, the same as if we would integrate the views of ISIS extremists as to be normal in our society – they must be treated as abnormalities to get reliable data. 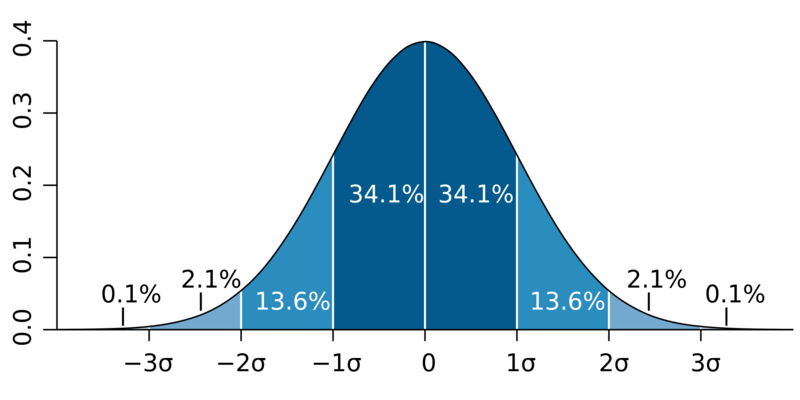 In science, the 5% on the edges are usually disregarded. The result is that we find a temperature variation of 2.8°C. This variation is caused by “natural” causes such as variation in solar activity etc. It is this bandwidth that is invisibly interwoven in the glaciation graphs. It must be filtered out to find the matching crustal deformation pattern. Notice that the tree rings do not agree with the climate warming hysteria. Source: Johannes Gutenberg University Mainz. Fig. 5: This figure shows how the Gauss distribution works with the σ limits. The 2σ or σ95 limits are in most real-world cases the best choice because extremities are neglected as anomalies due to many possible causes, such as errors, misreading, etc. In Fig. 3 and Fig. 4 we show that the temperatures on Earth vary between a relatively small band of 2.8°C. Larger temperature variations, as they are presented in glaciation graphs, are in fact incorrect presentations because crustal deformations caused massive climatic changes that can be found as proxies in the ice cores of Antarctica. Now that we have the correct data, filtering out the natural temperature variations is not so difficult anymore. We have to “cut off” the highs and lows with the 2.8°C that we have distilled from the glaciation graphs to find the remaining “fingerprint” of the crustal deformations. And if that results once again in matching data, we have confirmation that our proposed time frame of the poles is correct. Fig. 6: Here you see the glaciation graph constructed from core samples of Dome-C. We have downloaded and processed all the hard data for our research. We show here again the four crustal deformations A to D. The probability that the sequence is coincidentally the same as the pole sequence in Fig. 1 is less than 0.5%. That is a good start for a deeper research into the presence of deformation cycles in the glaciation graphs. The likelihood that ice ages are misinterpreted by science grows rapidly with each step we make. The larger the distance between peak and valley, the larger the crustal deformation, and the larger the distance between two consecutive geographic poles. Next, we have filtered out the natural temperature variations that we presented in Fig 3. and 4. | © Mario Buildreps 2015-2018. In Fig. 6 we have plotted on the horizontal axis a period of 800,000 years. 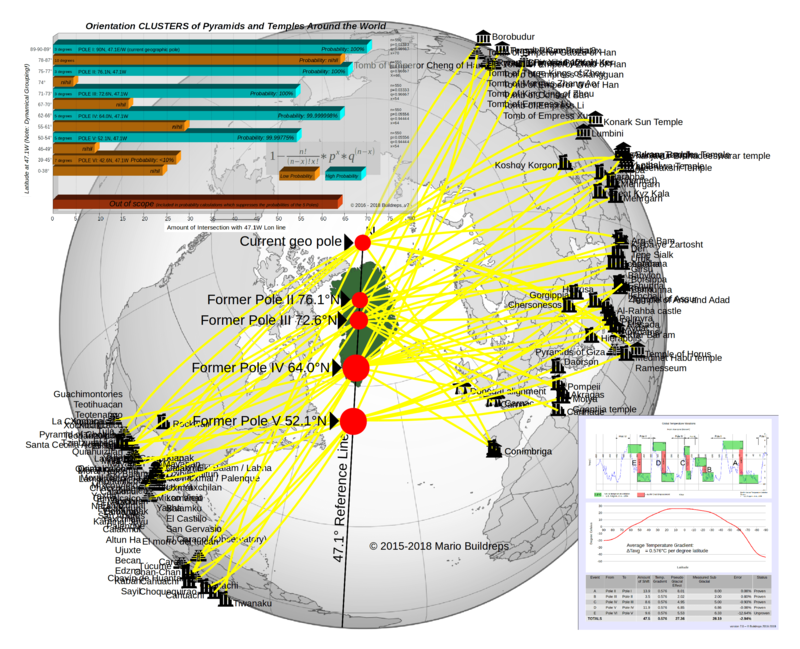 The data comes directly from the Dome-C ice cores on Antarctica. They are called proxies. The data values were checked and verified. The grid is divided into 20,000 years. On the vertical axis, we have plotted the temperatures. You see that over the last 440,000 years the global temperatures looked like a rollercoaster, jumping up and down between 8 to 14°C. 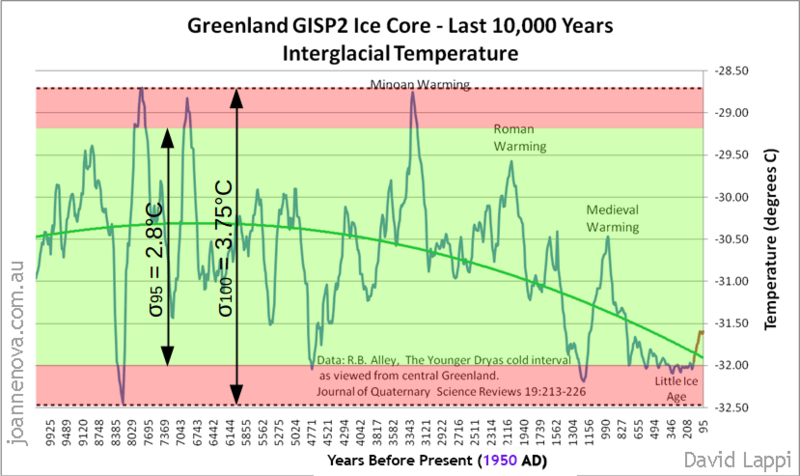 That’s very extreme because we have shown above that there is no evidence over the last 10,000 years that the temperatures varied more than 2.8°C. So, what made the temperatures jump up and down so much? It is important to note that the temperature variations are related to the eccentric orbit of the Earth around the Sun as we show in Fig. 2. Tilt and precession do not play any role in the onset of ice ages, that’s one of the most commonly made mistakes. Changing eccentricity causes no annual changes in solar radiation (less than 1%) received by the Earth. When the Earth’s orbit is most elliptical, the amount of solar energy received at the perihelion would be about 30 percent more than at aphelion. But compared to a cylindrical orbit, perihelion receives 15% more energy and at aphelion, it is 15% less energy. The point is that the overall solar energy budget remains equal over one year and that eccentricity does not influence the received solar energy over long periods. And yet there is a one on one relationship between ice ages and eccentricity. We have discovered that very elliptical orbits caused very large gravitational oscillations on the Earth’s crust. It is relatively easy to understand that these oscillations caused crustal deformations, and yet scientists haven’t figured this out for themselves. We have done all the work that the large institutions should have done. Believing in a steady sturdy planet makes it much easier for them to produce papers and to exploit a career. The truth, however, is far different. When the last “ice age” ended (on the right side in Fig. 6) between 10,000 to 15,000 years ago, you see the blue curve jumping back up and start to stabilize. In fact, you see every time after the temperatures dove down, they jumped back up again as if the Earth has a sort of “set point”. This set point is, of course, a stable crust, the upward flanks in the graph are the recuperation phases of the biosphere after a rough cataclysmic period, and the downward flanks are the crustal deformation phases. The variations in the setpoint are caused by a not completely recuperated biosphere before the next crustal deformation started again. A good example of this is around 210,000 years ago, where we see two short recuperation cycles after yet another occurring deformation. This happens only when eccentricity is very high (see Fig. 2). Once you grasp this, it becomes easy to understand. Providing bulletproof evidence is harder, but we have done that too. Fig. 7: When we reduce the peaks and valleys with the 2.8°C from the sequence A to D we distill the crustal deformations. The value of 2.8°C must be subtracted from both the peaks and valleys because these events do not occur at the same time. Hence, this variation is always present in the graph. The crustal deformations are depicted as red areas in the graph. They are what is left over when the natural variations are filtered out. But before we can prove that it was global cataclysms instead of “ice ages” that caused the crustal deformations, we have to rework the data into another form. The last millennium (our current era) in the graph is the era of Pole I, a period of stability. The downward flanks in the graph are crustal deformations, and the upward flanks are the recuperation of the biosphere after a period of crustal deformation. | © Mario Buildreps 2015-2018. How Did We Prove That Glaciation Cycles Were Crustal Deformations? We have proven that the geographic North pole moved in the latitudinal direction which clearly indicates climatic changes. Imagine your town shifting from the latitude of New York to the latitude of Miami. That would have serious consequences for the climate you are living in. Something similar happened multiple times in the past over very long periods of time. Our concept is simple and can be readily understood: it is cold at the poles and warm at the equator, the latitudes in between are of intermediate temperatures. the temperature change that we have crossed is relatively small. Fig. 9: The closer to the equator the larger a certain climate zone becomes. 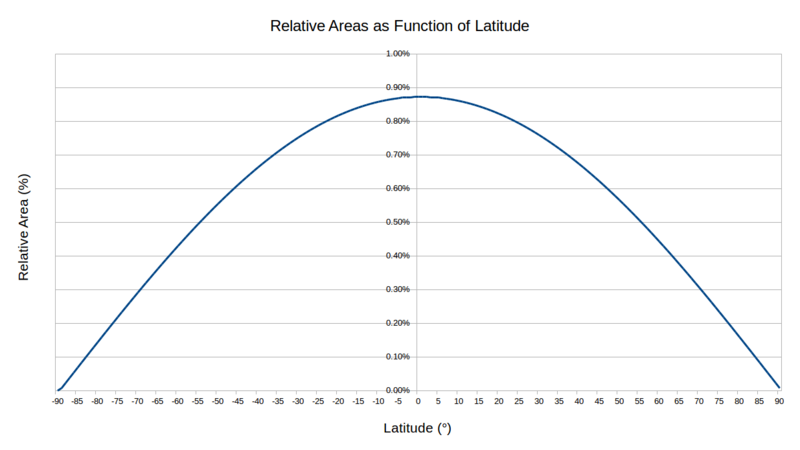 An infinitesimal step in latitude from one of the poles in no matter which direction delivers a number close to zero, while that same step on the equator delivers a very small number but significantly larger than the step on the pole. The mathematical expression for this principle delivers this graph. The math that we used to finally distill the ultimate number – the number that expresses climatic changes when the Earth’s crust deforms – is called calculus. When we integrate the points where the graph “hits” the x-axis (on the left and on the right) we have, by definition, covered the whole area of the earth from pole to pole, which is 100%. The full version of our calculations is far too difficult to show on this webpage. Scientists love to intimidate us with impressive equations while first, they should be in the position to explain what they are doing in normal language for normal people. The whole subject is already difficult enough to understand. | © Mario Buildreps 2015-2018. The next step is to “walk” from pole to pole in very small steps and to multiply the changes that we find between every latitude in both graphs of Fig. 8 and Fig. 9 with the help of calculus, the powerful mathematics used for this process. When we make a step on the X-axis, for example from 90 to 89 and then follow the graph, we note the differences that the graph makes on the Y-axis. Our behind-the-scenes data processing is an immense undertaking that is only comprehensible for mathematicians. It would be intimidating and demanding to share it online. It is important to understand what the method is about. We now have found Earth’s fingerprint when the crust deforms in the latitudinal direction, i.e. what kind of information you would find if you were to take ice core samples and why they would show such large jumps. Cdef = ∑ |ΔT|·ΔArel = 0.576°C. We called this the crustal deformation constant, Cdef. This number should be a holy number for every geologist. Note that ΔT (written as |ΔT|) is an absolute value; otherwise, we would end up with a value close to zero because of the nature of the temperature from pole to pole. When the crust deforms in the latitudinal direction – which is the only logical effect because the crust behaves like a spinning top that is affected by an external force – we will find patterns or fingerprints of this movement in very old ice cores. 10 degrees of a crustal deformation in the latitudinal direction leaves a fingerprint of 5.76°C (10 * 0.576 = 5.76) in the ice sheet of Antarctica. Wild guesses circulate in the academic circles about the age of the Greenland ice sheet but they are unscientific. We have 100% proof that Greenland’s ice sheet is not older than 300,000 years. The ice sheet on Antarctica, on the other hand, is in fact incredibly old. This knowledge is fairly reliably obtained by dating the so-called blue ice. Indeed, there is good evidence that Antarctica’s ice sheet might be older than 3 million years. This evidence lacks completely for Greenland and knowing this has profound consequences; the South pole was stable while the North pole was unstable. Antarctica did not move at all over the last 340,000 years, while Greenland was catapulted over the North pole and most of the crust was heavily deformed. That is the reason why the Antarctic ice sheet holds a precious key to our ancient history. Why is This 100% Proof? We have here two (seemingly) independent patterns that fit one on one onto each other. It is possible to calculate the probability for these two patterns to fit coincidentally onto each other. The simple patterns of Fig. 2 fit onto each other, which gives us a probability of 1 to 256 that this is coincidental, hence 99.6% that it is indeed related. It is in our view not spectacular but good enough for a deeper investigation, which we did. The complicated patterns of Fig. 7 matches one on one onto each other, where we considered the natural temperature variation σ95 over the last 10,000 years, and the exactly matching polar movements which we multiplied with our other discovery, namely the crustal deformation constant, Cdef. The patterns match with an accuracy of less than 10%, not one time, but four times in a row. The probability for this to occur coincidentally with well-founded scientific data is 1 to 750,000, hence we have a 99.999867% certainty that our discovery is true. We are therefore 100% certain that our time frame for the ancient poles is correct, and this has profound consequences for the age of the foundations of ancient structures. We now understand how old they really are, what happened to these ancient civilizations, why there are so many mysterious ancient sites around the world allegedly built within a few thousand years but in reality are hundreds of thousands of years old. With our method, we are able to explain one of the biggest questions of science. Running time backwards, how would the 47.1 reference line move as the earth got smaller? And where would the Former Pole positions move to as the earth became smaller? Would they move back north? The spread record on the ocean floor implies a steady growth of the earth. If the Former Poles were “marked” during the interglacial periods, there might not be a need for a cataclysm to explain the re-orientation of the temples. Hi Bradley. The geo pole moved because the expansion in the Pacific was much greater than on the Atlantic. These crustal changes are amplified by a high eccentric orbit around the Sun. That is why glaciation cycles match the eccentrical sequence. We estimate that the earth expanded between 1 or 2% over the last 500,000 years. That does not significantly influence the position of the poles, i.e. it is in the margin of error. The electric universe explains where the mass is coming from. The universe is full of unobservable energy or dark matter. Thank you for your comment! Hi Mario, I really admire your work and just keep on reading your articles. If you look at your research the oldest pole that can be proven is pole V. The reason for this is that there are enough ancient structures to prove it. There are other ancient structures in the database that seem to point to an older pole VI, but this can not be proven yet. The ice core data goes even a lot further than 600.000 years. And there are apparently structures in the database that go beyond pole VI. The fact that the first ancient structures pop up around the period of pole VI could indicate that the period of earth crust stability during pole VI was a relatively long one. This is visible in the graphs. So it enabled people to develop considerably and make their first sophisticated structures. At the same time, the eccentricity during this period of earth crust stability was relatively low. Now if we look at how high the eccentricity currently is, it is close to the eccentricity that was during the period of earth crust stability of pole VI. If we look at the shape of the graph of the changes in temperature during our current pole, we see this relatively low eccentricity similar to the eccentricity of pole VI and we see a relatively long period of a more or less stable temperature. If we look at pole VI we could imagine that this stable period of our current pole has been going on already relatively long compared to pole II, III, IV and V and will continue for quite some time. Possibly longer than the 5000 years that you mention. So based on the similarity to pole VI, I would assume that this stable period will last for maybe 10000 years from now. You say that seismic activity has increased with a factor 5 over the last 100 years. And this is considered to be a proxy for the earth crust deformation. This suggest to me that the last 100 years could be considered as some kind of turning point and that we should expect that things will get worse from now. But to me that seems to contradict with the longer stable period during pole VI. Do we even know if the seismic and volcanic activity are reliable proxies to measure earth crust displacements? Is and observation time of 100 to 200 years long enough to be sure that the factor 5 increase of seismic activity is telling us something about earth crust displacements? Wouldn’t it be necessary to look at deeper layers of the earth as that is where the oscillations are best measured? I assume that the high increase of seismic activity can also have another cause: increase of cosmic rays because of lower solar activity. It does also seem to have an effect on global cloud cover according to the research of Svensmark, which explains heavy rainfalls at certain places in combination with record droughts at other places. And even more intense formation of contrails. So the high increase of seismic and volcanic activity might be not related to earth crust displacements, but to a temporarily effect of higher cosmic rays. If that is the case, it could be that it does not say anything about earth crust displacements. At least not with any certainty. The only proxy that we know of to be reliable to predict earth crust displacements in the future are the Milankovitch cycles. Thank you for your interesting in-depth comment, Kenneth. In short, Pole VI cannot be proven due to the large area over which the node is formed in combination with the scarcity of ancient structures. There seems to be no possible way to get it ever proven. The eccentricity during Pole VI was indeed similar to that of today. Of course, it is possible that it takes longer than 5ky before the crust gets unstable. I don’t see how increasing seismic activity over the last 100 year would be a turning point already now. It will become much worse over the next millenniums to come. The earth will become almost inhabitable even before crustal instability starts. Of course, we cannot tell with 100% certainty yet that volcanic and seismic activity are reliable proxies. They are in our method not used as proxies either. They are a way to predict what is going on currently underneath our feet. If we look at the past events over the last 400,000 years we see during the crustal deformations increasing dust concentrations. The dust concentrations do not precede dropping temperatures, they follow temperature, hence they follow crustal deformations. Dust concentrations are plotted at the bottom of the graph in red. That is why we are almost certain that volcanic activity is a proxy. Volcano eruptions are equivalents of earthquakes. They are the same thing expressed in another way. Hi Mario, thank you for this clear explanation. So an increase of 5 times in 200 years of volcanic activity is relatively not impressive I suppose. And looking at the dust concentrations the volcanic activity has been much higher in the past. I will also read your article about The Younger Dryas Impact Hypothesis as I see it describes this in more detail. Yes I can imagine. I would be interested to know what data can be concluded from there are very large oscillations on the Earth’s crust. It does seem to be a statement without any evidence being presented at the moment. Other than this is a good explanation for the deformations of the crust. The idea to get humanity to Mars is the same as the CO2 story I guess. First an imaginary problem is created and the urgency is exaggerated. After that funds are raised and solutions are developed that can be sold. And a group of stakeholders forms around this business venture. Your research can do a lot of good in the future to explain the real mechanism of climate changes in our past. It also supports the idea of cataclysms which it proves to have happened in the past. At the same time, it leaves room for different interpretations on how far away future cataclysms are. It would be great to be able to show with the method that future worldwide cataclysms are only to be expected over thousands of years to prevent any imaginary business ventures forming around this idea. In this research the position of the sun is measured during 50 years and it is noticed that the position changes over time. From which is concluded that there is a slight wobble in the spin axis of the earth. The data shows that since 2002 this wobble did increase. https://www.youtube.com/watch?v=RrcGQWeO3Jw [23:10 for the graph showing the wobble]. Is this the nutation of the earth and is this movement correlated to the oscillations that are caused by the eccentric orbit?